Road trips are escapes from the routine at the speed of life. Americans and cars go together like apple pie and ice cream. We enjoy our cars, especially for road trips! 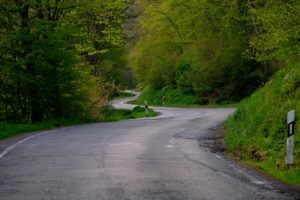 Many of us don’t typically experience carsickness, but you throw in enough curves and hills as we motor toward the end of a day’s driving, and some of us will feel queasy. The fact is, any of us may experience carsickness under the right (or wrong) circumstances. There are a few things you can do to try and get to the end of your driving day puke-free. Most importantly before you hit the road make sure you have a Reliefband for everyone in the car. Take frequent driving breaks to get everyone out of the car and check out the scenery. Keep a stream of cool air blowing in the face of each person while the car is in motion. Don’t consume greasy or heavy food, and keep the smelly food for another time. Eat light snacks while in the car. Stay hydrated with non-sugary liquids – plain water is perfect. Keep your eyes focused on the horizon (not at scenery zipping past the side of the car). Be aware that it’s possible for anyone to get carsick, or even all your passengers. Be prepared, have fun out there and live life in full motion with Reliefband! Copyright © 2019 Relief Band. All rights reserved.